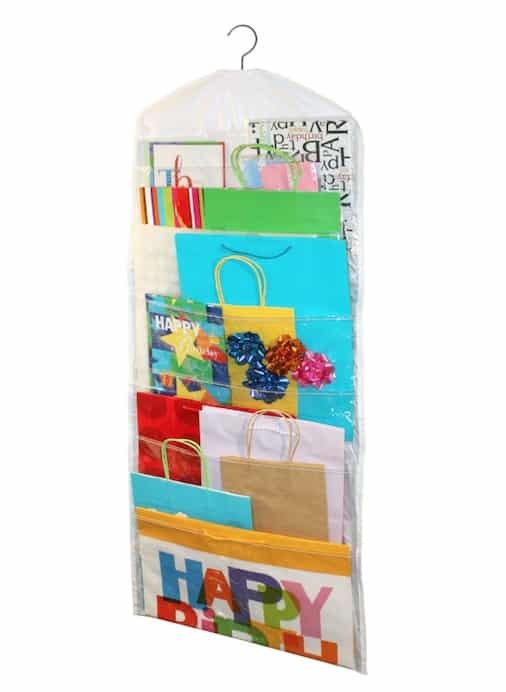 I save just about every bag, bow, tag, piece of tissue paper and ribbon that usually comes along with the kids’ birthday parties and holiday events, but to be honest, I don’t end up recycling them because they are so unorganized and hard to find in the back of my spare closet, so you can see why I love the idea of this hanging gift organizer! It wouldn’t take up hardly any space, however, because it so flat and meant for bags and paper, I can see how you still might need something to store your bows and other things that you don’t want crushed. Check it out here on Amazon. Mind blown! The idea of simply hanging up your luggage in a closet is just plain genius. If you travel a lot, this is a must– It’s one less bag on the hotel room floor! You can pick one up from Rise Gear, or something similar (more of an insert for any bag) here on Amazon.